If we understand these processes well enough, scientists can include them in computer models of coastal change that can be used to forecast, for example, how the shoreline will react to severe storms and how it could change over years, decades, or even centuries. Coastal communities can use these forecasts to plan for storms, sea-level rise, changes in sand supply, and other threats. “When a storm is on the way, it’s really powerful to be able to say: Here’s how the water and sand will move,” says Shawn Harrison, a U.S. Geological Survey (USGS) postdoctoral oceanographer. That’s why USGS scientists have installed video cameras pointed at beaches on the coast of western Florida and central California. They’re analyzing the videos to measure features of the beach and ocean so they can improve coastal-change forecasts. In Santa Cruz, California, Harrison and ocean engineer Gerry Hatcher installed two video cameras on the roof of the 10-story hotel, Dream Inn. One camera looks east over Main Beach, and the other south over Cowells Beach. Starting in May 2017, the cameras recorded video of the beach and ocean for 10 minutes every half hour during daylight hours. Selected images are posted online. 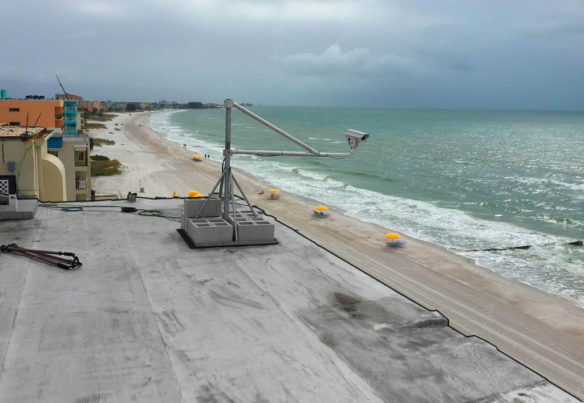 Research oceanographers Jenna Brown and Joe Long installed a camera atop the Shoreline Island Resort in Madeira Beach, Florida. That camera has recorded video between sunrise and sunset for 17 minutes every hour since February 2017. The most recent images from Florida are also available online. The Santa Cruz and Madeira Beach websites both display two types of images. A “snapshot” is typically the first frame of a video—just like a still photo. A “time-averaged image” is an average of all the frames in a video. In Santa Cruz, for example, the scientists combine 1,200 frames per video. A time-averaged image provides several measurements of the coast. Breaking waves produce a band of white in the time-averaged image. A sandbar is probably beneath that bright band, creating a shallow area that causes the waves to break. Dark areas extending out from the shoreline mark rip channels, formed by rip currents. Rip currents are fast, narrow, and often dangerous flows of water moving away from the shore. The line between dry beach sand and wet sand shows the maximum elevation reached by waves, or sunup. Left: Snapshot of Madeira Beach, Florida, on June 20, 2017. Right: Time-averaged image, created by averaging the intensity of light recorded at each spot, or “pixel,” during the video. The pale band offshore reveals where a sandbar caused waves to break. On the beach, the line between wet and dry sand shows the maximum wave runup during the video. Cowells Beach in Santa Cruz, California, from a 10-minute video shot on May 6, 2017. Snapshot on the left; time-averaged image on the right. Other image types provide even more information. “Each element in an image, called a pixel, contains color intensity, which can be used to extract information about changes along the coast,” says Brown. Views of Madeira Beach (left) and Cowells Beach (right), showing “pixel instruments” measured during each video. The blue dots mark pixels used by cBathy to estimate water depth. 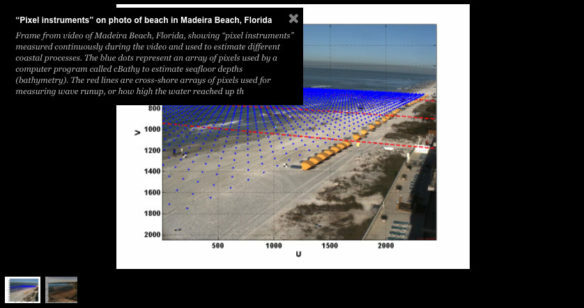 The red, orange, and yellow lines indicate pixels used to measure wave runup on the beach. 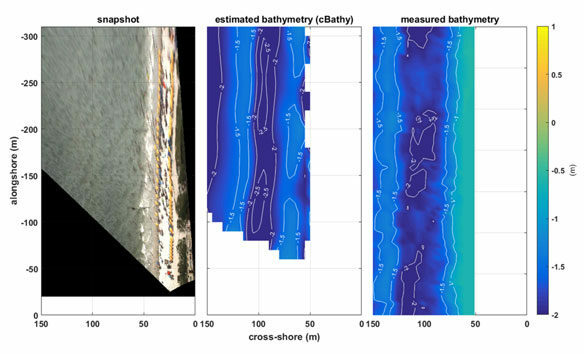 USGS scientists use “cBathy,” a computer program which analyzes groups of pixels to detect passing waves, then estimates the water depths, or bathymetry, required to make those waves. Combining results from many pixel groups creates a bathymetry map of the seafloor. Scientists have long made measurements at single points and along lines or “transects.” For example, current meters can measure ocean currents at one point, and small boats with sonar can measure water depths along multiple transects. A video system “is not going to replace any of those [traditional techniques],” says Harrison, “but it lets us do things that we couldn’t do otherwise.” Video cameras can collect data almost continuously over longer periods, and supply more detail over a larger area. During bad weather and high surf the cameras continue recording data, when it would be dangerous to use a boat or personal watercraft. These camera stations are also much less expensive than traditional oceanographic equipment. “The whole [Santa Cruz] system cost less than $5,000,” says Harrison. The Santa Cruz camera station includes two cameras in weatherproof cases and a computer in a separate weatherproof box. 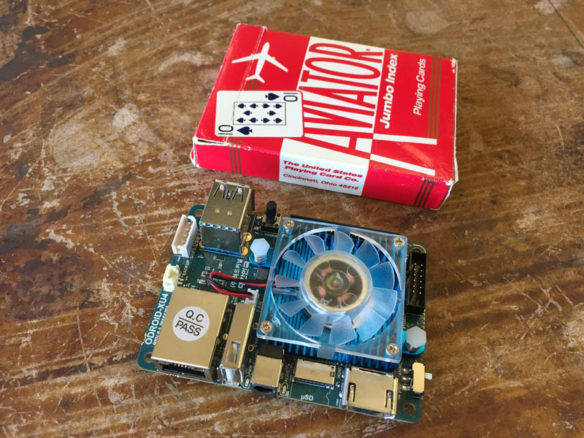 The computer is smaller than a deck of cards, costs less than a tank of gas, and uses easily replaceable parts. The whole system runs on a rechargeable battery, solar power, or a standard wall outlet. The Madeira Beach station is similar but uses a larger computer. Brown built and installed that station months before Hatcher and Harrison started, so she helped them with system design. One of her recommendations was to make a smaller, portable system to capture big storms. “We have now built a system like ours for Jenna,” says Hatcher, so they can be deployed before a large storm or hurricane. This information will help scientists better understand the impacts of these large storms. Harrison and Hatcher also got tips from John Stanley, a senior faculty research assistant at Oregon State University (OSU). Stanley helped develop coastal video systems as part of OSU’s Argus Program, which inspired the USGS camera stations. Development of Argus started in the early 1980s under Rob Holman (currently OSU professor emeritus) and his team. After more than 30 years of academic research and commercial applications, in 2016 Holman released the software and shared his expertise with the public under an open source license. The international community of Argus users embraced the move, and created an online knowledge base and software repository at the Coastal Imaging Research Network (CIRN). Brown is particularly interested in how beaches respond to storms. She compares beach surveys from before and after storms, “but I would really like to capture and examine the processes occurring during the storm.” The Madeira Beach camera station, and the more portable system from Harrison and Hatcher, should enable her to do just that. 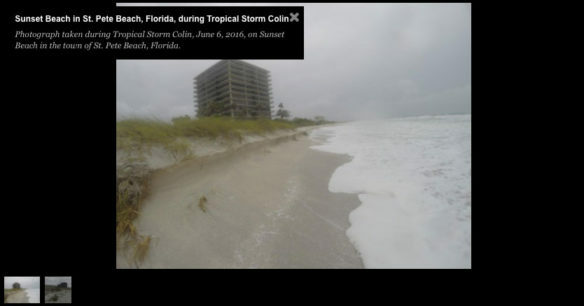 Photographs taken during Tropical Storm Colin (left, June 6, 2016), and one day later (right) in the town of St. Pete Beach, Florida. Storm waves eroded the beach and dune, producing a cliff- like feature called a beach scarp. Continuous video collected during a storm could help scientists better understand how this happened. Credit: Jenna Brown, USGS. According to Harrison, those computer models currently oversimplify how waves and currents behave, and how those forces move sediment and change the seafloor. 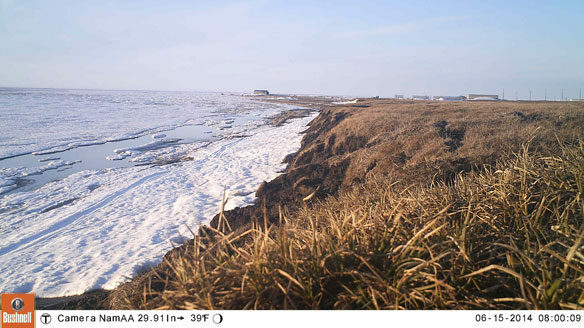 He wants to use data from the videos—especially during a single storm—to improve the models. “We’re able to track the movement of morphological features as they adjust to waves and currents, and that gives us something to shoot for in our model simulations,” Harrison says. 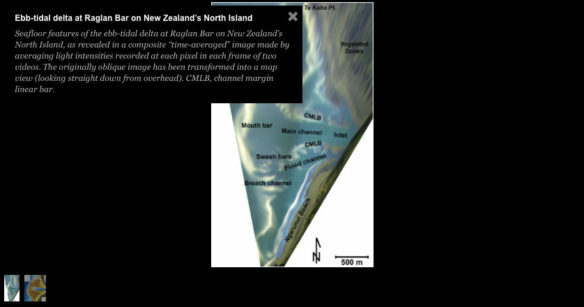 Left: A time-averaged image transformed into a bird’s-eye view of New Zealand’s Raglan Bar delta. CMLB = channel margin linear bar. Analysis of many time-averaged images produced the map at right, which shows the average migration of sandbars over five years. “Once we get it right in our models, then it could be incorporated into operational coastal hazard forecast models,” Harrison says. 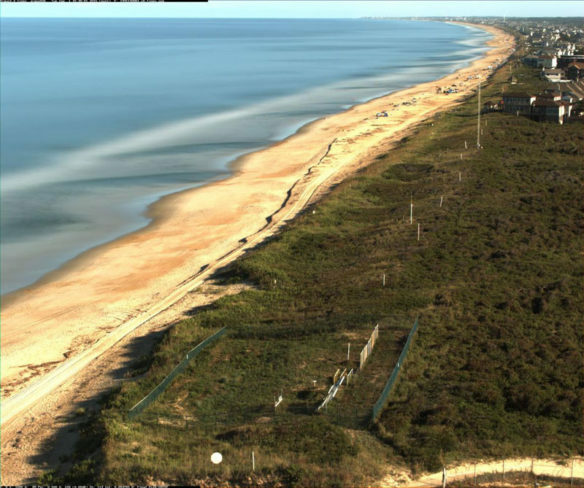 These operational forecasts, frequently updated like weather forecasts, can warn coastal communities about potentially hazardous beach and dune erosion. 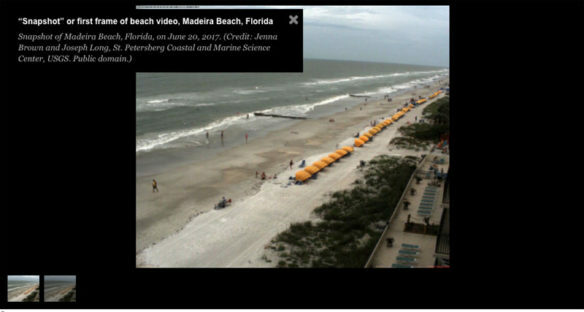 Data from the Madeira Beach video camera are already helping USGS researcher Joe Long fine tune the Total Water Level and Coastal Change Forecast Viewer. The web site displays forecasts for parts of the U.S. coastline using local beach characteristics. 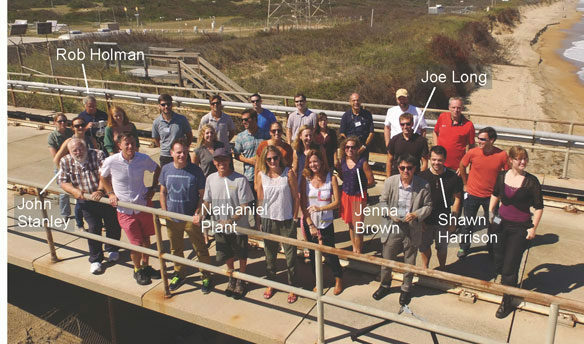 Harrison views the Santa Cruz camera system as both a long-term observatory, and a testbed for new ideas and improving the system. Eventually, similar systems could be used for rapid storm response, and for remote locations like Pacific island atolls or Arctic bluffs that are much harder to access.